If you’re as passionate about wine as we are, you probably want to share your message with the world: ‘I love wine!’. What better way than to express your love for the nectar of the gods than with a fun shirt? Yes, we are aware there are some pretty tacky wine-inspired clothing options. But that doesn’t mean they are bad. Sometimes all you need is a tacky, wine-themed shirt and a bottle of your favorite vino to have a great time! 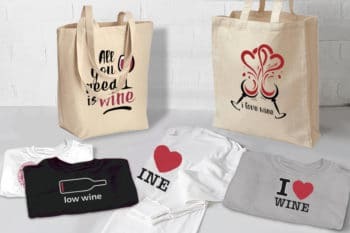 At ilovewine.com we’ve rounded up our ‘Best Wine Apparel’ favorites. Divided shirts for him, and shirts and tanks for her. Or mix and match them, whatever you prefer. 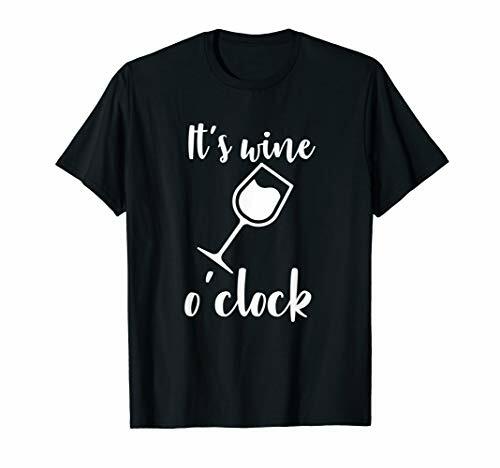 This great t shirt with its elegant writing and the inviting wine glass is ideal for anybody who works with wine or simply loves to drink a good glass of chardonnay, merlot, riesling, pinot grigio, cabernet sauvignon, bordeaux, etc. The It’s Wine O’Clock T-Shirt by Tees for Translators is simple, yet striking. The black shirt features a white print of a wine glass silhouette and a graphic quote. The lettering reads ‘It’s Wine O’Clock’ in a stylish font. This t-shirt is made of lightweight cotton for a soft, comfortable fit. The tee has a double-needle sleeve and bottom hems, ensuring it won’t unravel after one wash. At ilovewine.com we like the contrast between the black shirt and white print. But, if you want more color, the tee is also available in blue, red, green, and purple. Machine washable and tumble dryer compatible, it’s a great everyday-wear shirt to communicate it’s time for a drink. Cheers! NFL fans rejoice: you can now express your love for football AND wine in an eye-catching way. 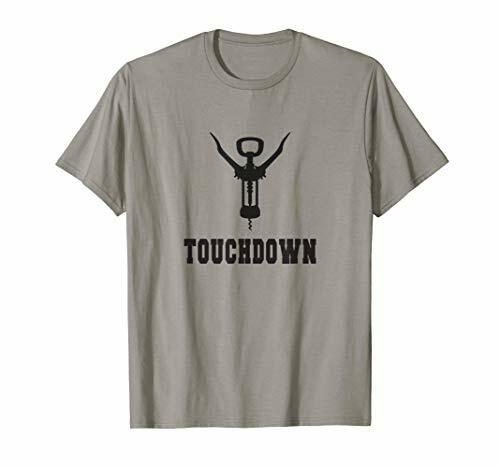 The Touchdown Wine Bottle Opener T-Shirt is a must-have for those that love the game and their wine. This comfy tee features a humorous wine opener silhouette and ‘Touchdown’ lettering. The design by Gifts for Wine Lovers Shirts is a perfect gift for any occasion. Struggling to find him an original present? We’re sure any footy and wine loving guy will gladly receive this original gift! Made of quality cotton, the lightweight shirt is comfortable and has a classic fit. Available in 4 neutral colors and sizes Small to 3XL, there’s a perfect touchdown shirt for every wine & footy fan! Do you love drinking wine? If so, then this distressed t-shirt is for you! 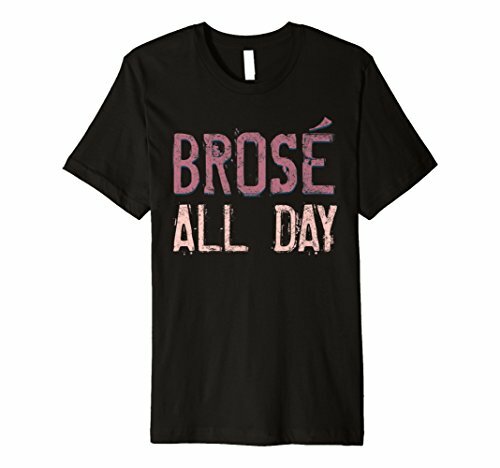 Get this cute bro rose shirt as the perfect gift for anyone who'd brose all day! Real men won’t shy away from this Brosé All Day Shirt. Show your love for your bro’s and your vino’s with this novelty tee. The design features distressed lettering that read out ‘Brosé All Day’, printed in two different shades of pink. Bang on trend, this graphic shirt has a slim fit. If you prefer a looser fit, the makers recommend ordering a size up. Made of lightweight jersey fabric, the t-shirt is very soft and great for everyday wear. This Best Wine Apparel choice is machine washable and tumble-dry safe. It comes in the colors Black, Navy, Asphalt, Dark Heather, and Heather Blue. Sizes range from small to 3XL. There’s a match for every rosé-loving bro’s body-type! STYLE: A must-have comfortable and RELAXED FIT, SUPER SOFT blend of cotton/polyester with CREW NECK TEE, SHORT SLEEVES. 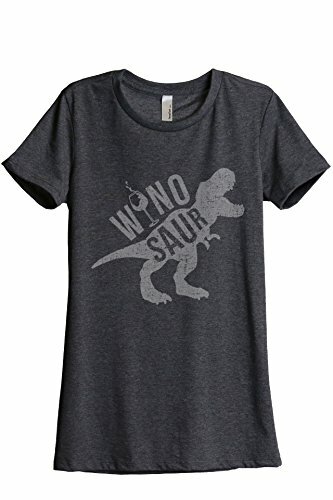 The Winosaur Tee by Thread Tank is a fun way to display your primal love of wine! This pun-inspired shirt is printed with a T-Rex silhouette. The lettering reads ‘Winosaur,’ with the ‘i’ substituted by a wine glass drawing. The t-shirt itself has a crew neck style and a fitted silhouette. If you prefer a looser, flowy fit, we would advise you to size up. The fabric is a cotton and polyester blend, suitable for machine wash and tumble-dry. It is only available in a charcoal grey version and comes in the sizes Small to XXL. Shall I reveal one of my own guilty pleasures in life? Drinking wine in my activewear. That’s right. There’s something a bit naughty about drinking whilst wearing yoga leggings. I personally love lounging on a lazy Sunday afternoon in comfy sportswear with a glass of wine. 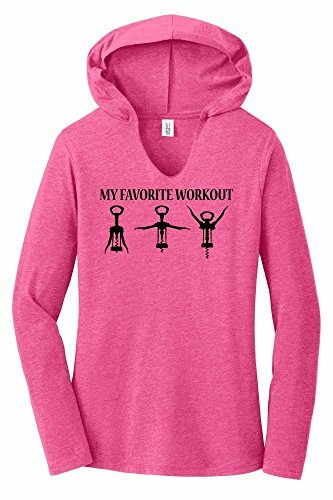 Which is exactly why I simply had to include this Favorite Workout hoodie on this Best Wine Apparel list. Similar to the Touchdown Tee in the male selection, the design uses a corkscrew cartoon to make a point. Or should we say: pun. The hoody features 3 corkscrew silhouettes in various, exercise-inspired poses. Above the lettering ‘My Favorite Workout’ communicates the message perfectly. This humorous hoodie is made of cotton, polyester, and rayon. The lightweight fabric makes it soft and comfortable for everyday wear, even an actual workout. The sporty design silhouette is quite fitted and has a split, V-shaped neckline. The Favorite Workout top is available in sizes XS to XXL – and comes in the colors Fuschia, Grey, Black, and Navy. There are some pretty awful wine shirts. You know, the kind that is so wrong, that it’s actually right. Just like ugly Christmas sweater, there’s a certain level of tackiness that just hits the right mark. Which is where this shirt comes in. If you, or a loved one, appreciate cats and wine, why not let the world know via this striking design? 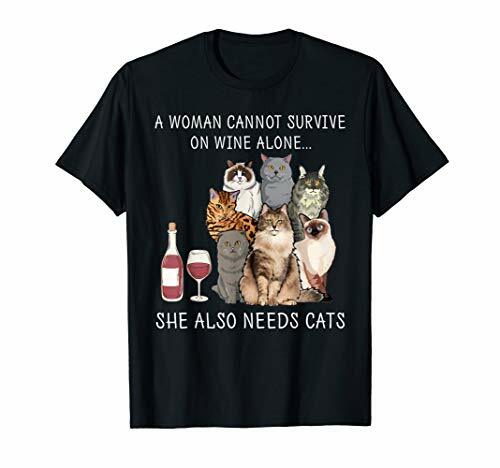 The tee features a quality print of 7 cats, a bottle of wine, a wine glass and the quote: “A woman cannot survive on wine alone” … “she also needs a cat.” Don’t hide your affections for cats and alcohol, celebrate them by wearing this one-of-a-kind design while indulging in a glass of vino! The shirt is a soft, lightweight cotton and can be machine washed cold. You can also tumble-dry it on a low setting. Easy to wear, easy in care. The silhouette has a classic, fitted shape with double-needle hems. 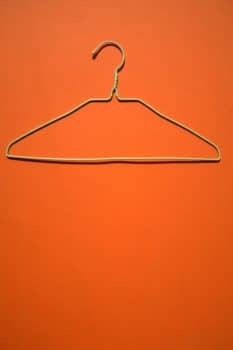 It’s available in a range of sizes and 5 different colors. So, what are you waiting for? Get your hands on this tacky, yet fabulous choice in Best Wine Apparel today! Make the most out of a bad situation with the Panoware Wine Tank Top. This pun-inspired design features a sporty racerback silhouette with a slightly flowy fit. Lightweight and breezy, it’s perfect for a quick sprint to the liquor store on a warm day! 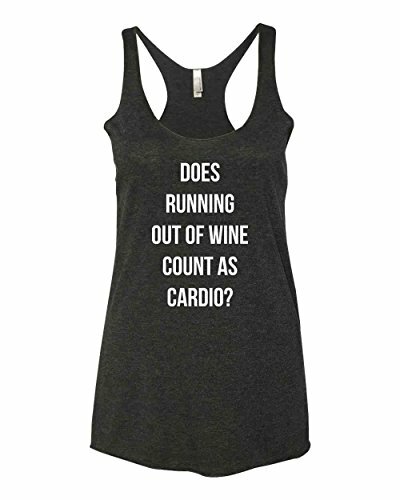 The top itself reads ‘Does Running Out Of Wine Count As Cardio’, printed in a modern white font. The design also has exposed stitching on the armholes, neck, and bottom hem; which creates a casual look and feel. The racerback tank is made of soft, ringspun cotton and rayon. It can be machine washed and tumble dried, making it an easy to care for daily apparel choice. Its size fits as expected according to user reviews. However, you can always size up in case you prefer a looser silhouette. This ‘Best Wine Apparel’ choice also had very affordable pricing: making it a great, budget gift for your fitness & wine-loving friends. And if you are looking for something that is sure to get a smile check out our wine-bra review! 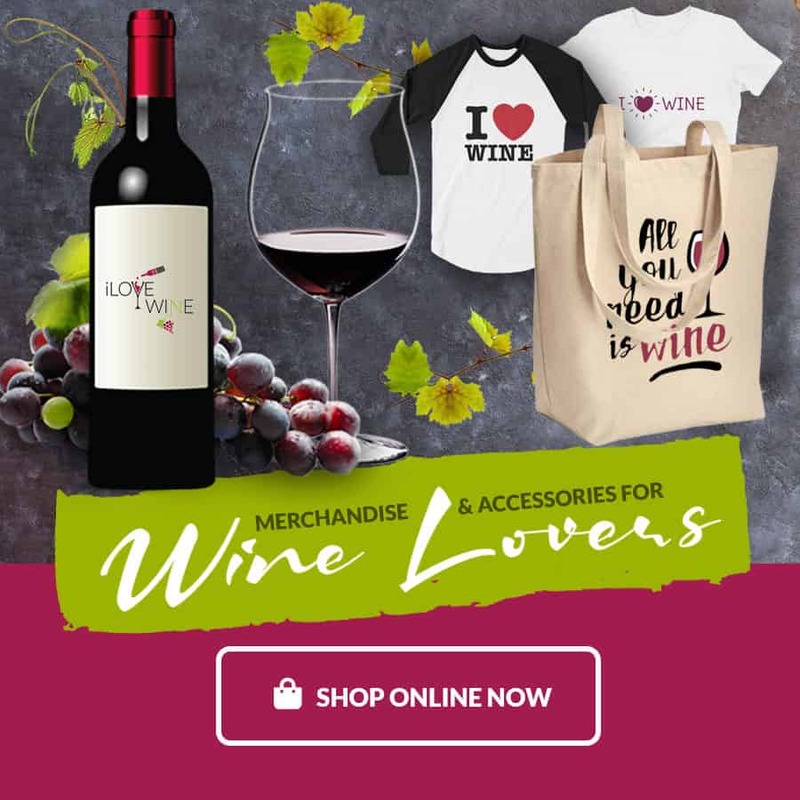 Ilovewine.com carries classic gifts for wine lovers, including t-shirts and aprons. Add a unique touch to wine gifts with personalized tote bags and more. Check out our online store now!